The AirStation 54 Mbps Wireless Desktop PCI Adapter offers a fast and flexible wireless solution for your desktop PC. With the AirStation One-Touch Secure System (AOSS) creating a secure wireless connection is now hassle-free! The low profile design of the PCI adapters can accommodate desktops with either a full size or low profile PCI slot. 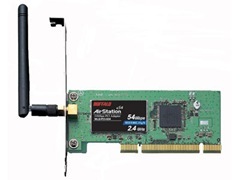 The 54 Mbps Wireless Desktop PCI Adapter is interoperable with both Wi-Fi 802.11g and 802.11b devices. The detachable antenna can be replaced with an optional external AirStation 2.4 GHz antenna allowing flexible placement and extended range. AOSS support (*AOSS Client Manager Required). Fast 54 Mbps wireless data transfer speed. Antenna adapter included for optional external antenna. Low Profile PCI fits in any PCI Slot. WPA (TKIP, AES), 802.1x support (supplicant required). Client Manager 3 for Windows ME, 2000, and XP. Adds AOSS support for Windows ME, 2000, XP. Windows Vista users please use Client Manager V.
Client Manager V for Windows Vista. Adds AOSS support for Vista. Download, 2.11 MB, 2007-06-05.